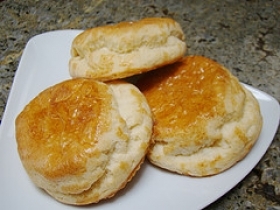 Have you made Beaten Biscuits? 1. Mix the flour, salt, sugar, and baking powder in a bowl or in a food processor fitted with a metal blade. 2. Add the shortening and cut in or process until the mixture is the consistency of coarse meal. 3. Pour in the milk and stir or process just until the dough holds together. 4. If it is dry or crumbly, add more milk. 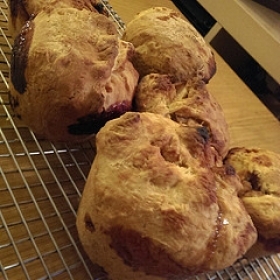 If it is too wet, add more flour. 5. Knead briefly in the food processor, then turn out onto a floured board or beat 1,001 times with a rolling pin. 6. when it's ready, the dough should "snap" when you hit it. 7. Fold the dough in half. 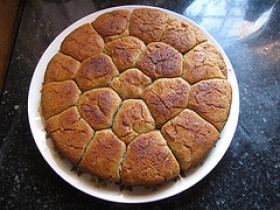 Roll out the folded dough until it is 1/2 inch thick. 8. Cut with a 1-1/4-inch biscuit cutter into small rounds. 9. 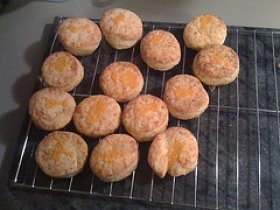 Prick each round with a fork, making two parallel sets of holes in the biscuit. 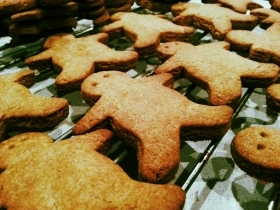 10. keep rolling out the dough, folding before cutting, until all the scraps are gone and you have made about 100 biscuits. 11. Preheat the oven to 350 degrees. 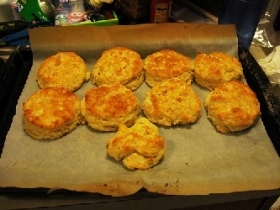 Place the biscuits on a lightly greased pan. 12. Bake for 30 minutes, until crisp, but not browned. 13. They should open easily when split with a fork. 14. 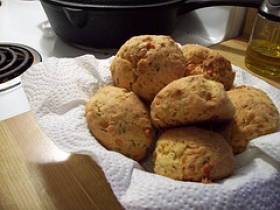 They will keep for weeks tightly covered in a tin or in the freezer. 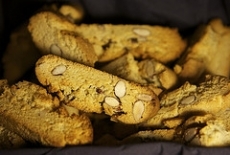 This recipe contains potential food allergens and will effect people with Wheat, Milk, Gluten, Natural Sweeteners allergies.